Heat oven to 375°F. Spray 15x10x1-inch pan with cooking spray. Place large piece of heavy-duty foil on lower oven rack to catch any juices that might bubble over. 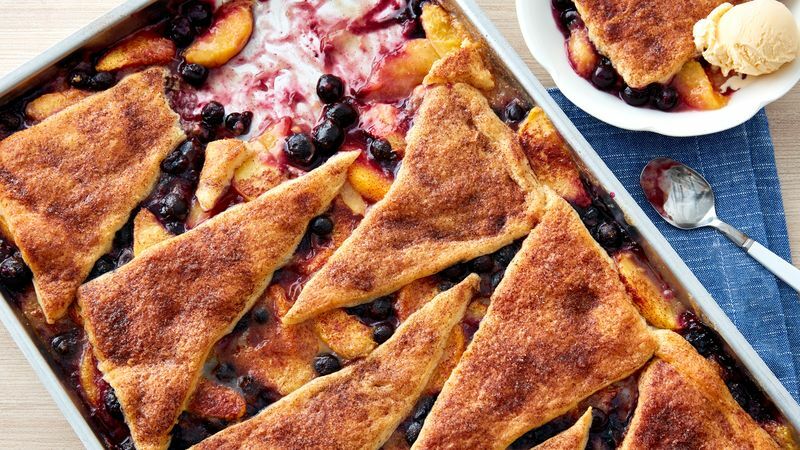 In 4-quart saucepan, mix peaches, lemon juice, 1/2 cup sugar, the flour and 1/2 teaspoon cinnamon with spoon until blended. Heat to boiling over medium-high heat, stirring constantly, about 5 minutes. Remove from heat; stir in blueberries. Pour hot fruit mixture into pan; spread evenly. Separate dough into 8 triangles. Arrange triangles over hot filling, alternating triangles to fit in pan but allowing a little space between triangles. Brush with melted butter. In small bowl, mix 2 teaspoons sugar and 1/4 teaspoon cinnamon; sprinkle evenly over dough. Bake 23 to 27 minutes or until bubbly and golden brown. Cool 15 minutes. Use spoon for serving. Serve with ice cream. For best success with this recipe, be sure to use a 15x10-inch pan with at least a 1-inch rim so there is less risk of juices bubbling over. To easily peel fresh peaches, blanch them in boiling water about 15 seconds. Remove them from water with slotted spoon, and they’ll be super easy to peel with paring knife.